Sweet Corn Curry with Grilled Shrimp - What the Forks for Dinner? 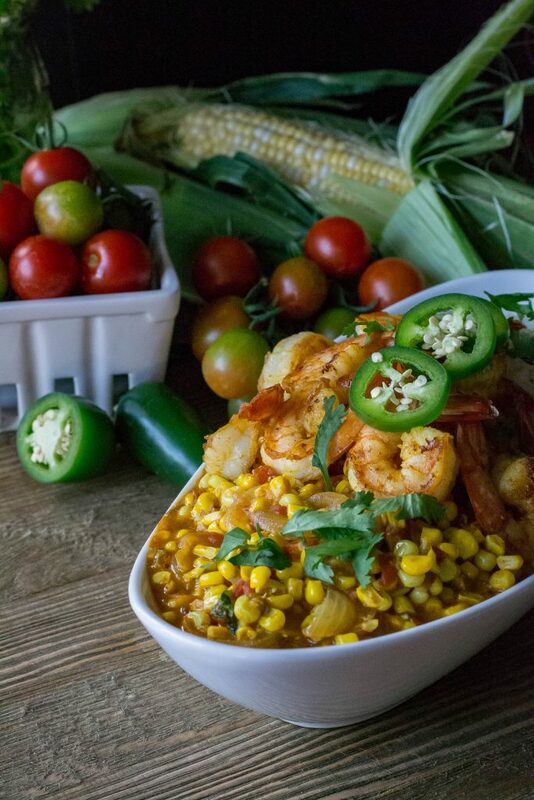 Sweet Corn Curry with Grilled Shrimp … Sweet corn season is in full swing. 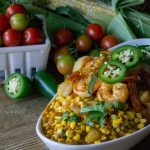 Summer sweet corn is one of my favorite veggies.We have many recipes for sweet corn at What the Forks for Dinner? With a local grower Selmi’s ,we are assured the best sweet corn. If you are ever in the area stop by… you won’t be disappointed. 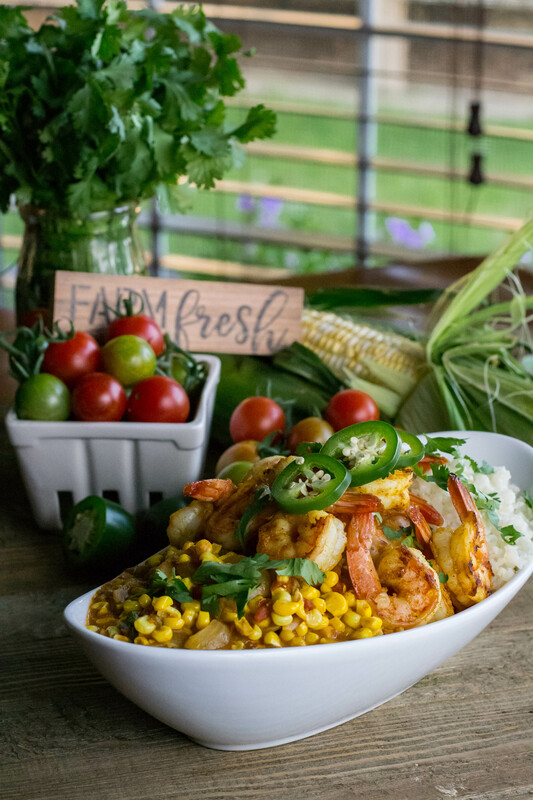 Looking for a new way to jazz up sweet corn…..it’s perfect on it’s own, but everything could stand a little jazzing up sometimes. Curry??? Why not? Curry being an umbrella term for dishes that traditionally are from India. The main spices in curry are coriander, cumin, ginger, chiles, and turmeric. Curry dishes may or may not have meat…..ours does. Dry curries, which are cooked with very little liquid and that liquid is allowed to evaporate leaving the dish coated with the spice mixture. 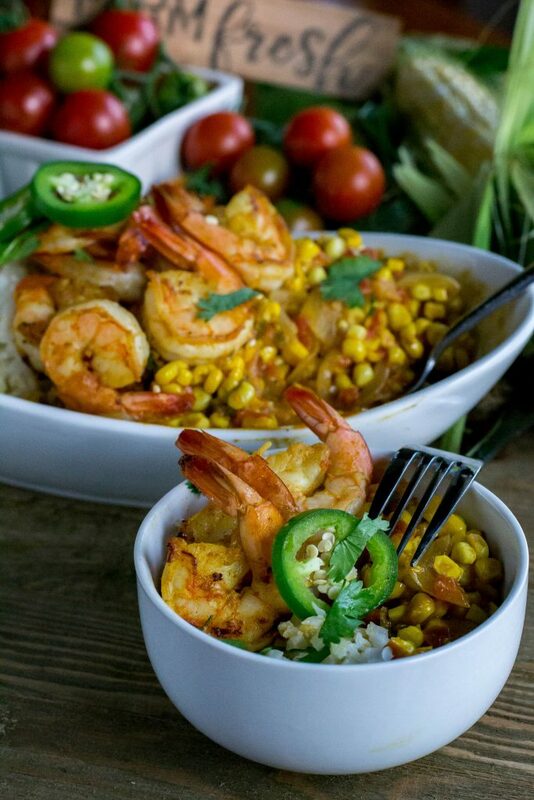 Wet curries such as Sweet Corn Curry with Grilled Shrimp have a lot of sauce with a base of yogurt, cream, or as I did, coconut milk. Who doesn’t love sauce??? 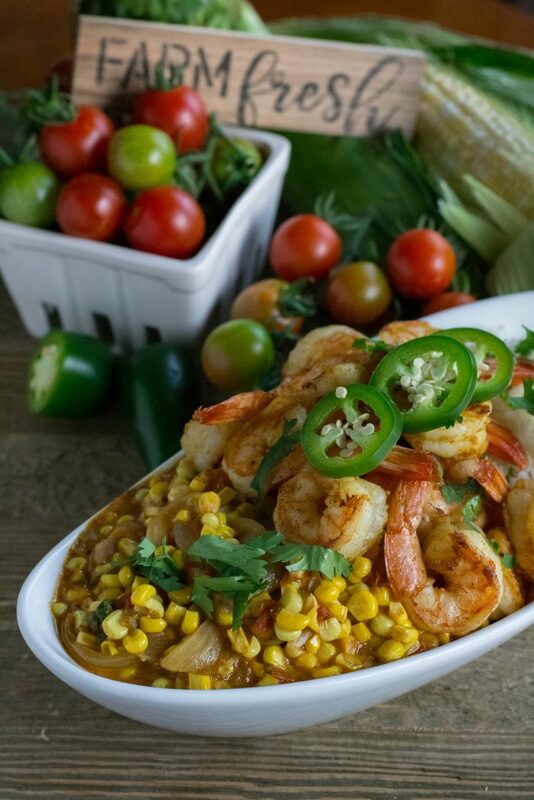 Using that delicious sweet corn and adding onion, jalapeño (Tim…. spice…enough said), garlic, ginger, and curry powder, I added in tomatoes and coconut milk. Then simmered into a beautiful sweet spicy wet curry. I used cherry tomatoes from my garden…….to say I have an abundance is an understatement…..look for more recipes with cherry tomatoes soon. 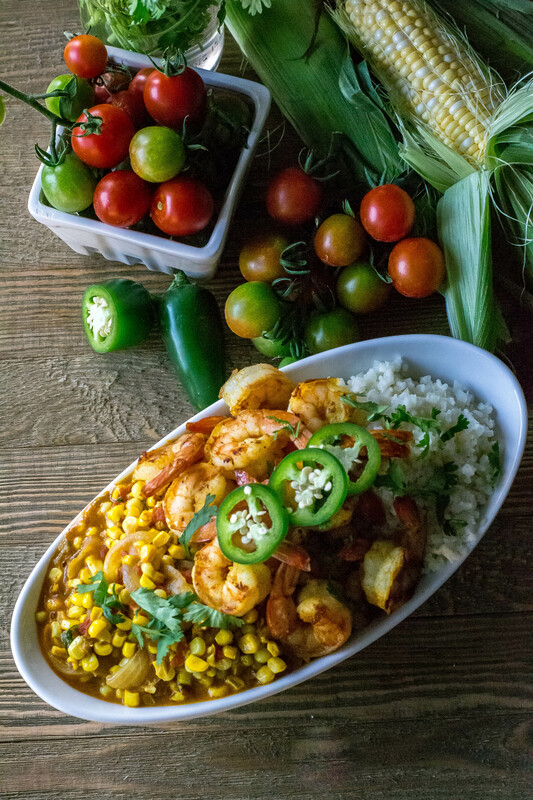 If you are vegan/vegetarian you can stop with the Sweet Corn Curry and have a wonderful dish, but Tim and I like meat…well in this case seafood. Vegan is not for us. Rice is a traditional accompaniment for curry. I used cauliflower rice. I love, love, love this stuff. You can buy it fresh or frozen already rice, or buy a head of cauliflower and rice your own. Being of the lazy, hating to clean up club….. I buy it already riced. Bowl meals are all the rage and Sweet Corn Curry with Grilled Shrimp covers that trend. Place all the segments of the recipe in a nice bowl and serve. Heat the oil in a large skillet over medium-low heat. Sauté onion stirring occasionally, until the onion is translucent, 5-7 minutes. Add the minced jalapeño, garlic, and ginger, and cook for 1 minute more. Add curry powdered cook for about about 30 seconds, stir in the corn and cook for another 2 minutes. Add diced tomatoes and 1/2 cup of coconut milk. Bring to a gentle boil, reduce heat to medium low, and cover. Simmer, stirring occasionally, for 20-30 minutes, until corn is cooked and tomatoes have broken down. Remove cover and stir in the lemon juice, remaining 1/2 cup of coconut milk and half of the cilantro. Cook for 2-3 minutes. Season to taste with salt and pepper. 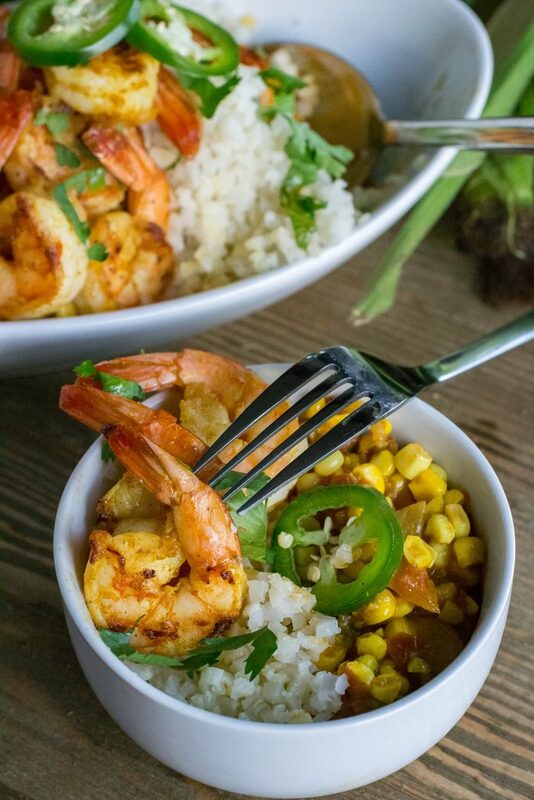 Serve with cauliflower rice and grilled shrimp. Cook cauliflower rice according to package directions. Add 2 tablespoons of coconut milk and cook until evaporated. Season with salt and pepper. Garnish with cilantro or parsley if desired. In a large zip loc bag place shrimp, curry powder and oil. Toss until shrimp is coated. Heat grill pan or grill to medium high heat. Remove shrimp from bag and place on grill. Grill for 3-4 minutes per side.